Until 2015, no refugees in Malaysia were able to access higher education, and they were unable to attend government schooling. Since then, six private higher education institutions have agreed to open their doors to refugees for the first time. This book contains stories from this small group of successful refugees, who have managed to receive higher education in a country that neither recognizes that they exist nor offers them even basic education. It identifies the factors that aided their success, and charts the challenges that they and their communities have faced. The authors present each story, based on interviews, within the context of the individual’s background and nation of origin. 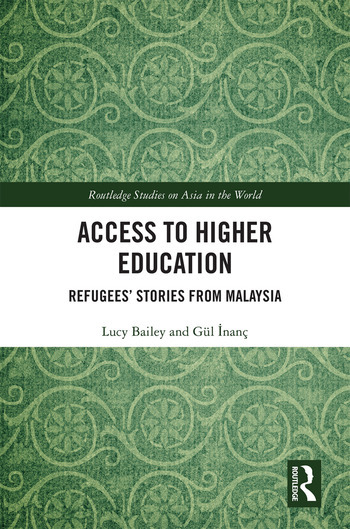 These stories are framed by a discussion of the situation that refugees face in accessing education globally, explaining how these stories and the methodologies used for this study are universal. Lucy Bailey is Associate Professor of Education at the University of Nottingham Malaysia Campus. Gül Inanç is a lecturer at School of Art, Design and Media, Nanyang Technological University, Singapore OUR - Opening Universities for Refugees.